The long-established CMOS14 SmartMX family features a significantly enhanced secure smart card IC architecture. Extended instructions for Java and C code, linear addressing, high speed at low power and a universal memory management unit are among many other improvements added to the classic 80C51 core architecture. The technology transfer step from 5-metal layer 0.18 μm to 5-metal layer 0.14 μm CMOS technology offers more advantages in terms of security features, memory resources, crypto coprocessor calculation speed for RSA and ECC as well as availability of secure hardware support for 2-key and 3-key Digital Encryption Standard (DES) and Advanced Encryption Standard (AES) operations. The contact interface availability, the optional contactless interface and the optional S²C interface enable the easy implementation of native or open platform and multi-application operating systems in market segments such as banking, E-passports, ID cards, Health cards, secure access, Java cards, Near Field Communication (NFC) connectable mobile hand sets as well as Trusted Platform Modules (TPM). The DES widely used for symmetric encryption is supported by a dedicated, high performance, highly attack-resistant hardware coprocessor. Single DES and triple-DES, based on two or three DES keys, can be executed within less than 40 μs. Relevant standards (ISO/IEC, ANSI, FIPS) and Message Authentication Code (MAC) are fully supported. A secure crypto library element for DES is available. SmartMX is the first smart card microcontroller platform to provide a dedicated high performance 128-bit parallel processing coprocessor to support secure AES. The implementation is based on FIPS197 as standardized by the National Institute for Standards and Technology (NIST), and supports key lengths of 128-bit, 192-bit, and256-bit with performance levels comparable to DES. AES is the next generation for symmetric data encryption and recommended successor to DES providing a significantly improved security level. A secure crypto library element for AES is available. SmartMX incorporates a wide range of both inherent and OS-controlled security features as countermeasure against all types of attack. Semiconductors apply their extensive knowledge of chip security, combined with handshaking circuit technology, very dense 5-metal layer 0.14 µm technology, glue logic and active shielding methodology for optimum results in CC EAL5+, EMVCo and other third-party certifications and approvals. SmartMX Memory Management Unit (MMU), designed to define various memory segments and assign security attributes accordingly, supports a strong firewall concept that keeps different applications separate from each other. Only the System mode has full access privileges to all memory space and on-chip peripherals, in User mode the privileges are limited. User mode restrictions are configurable by software running in System mode. The SmartMX security features are acknowledged as having outstanding properties by most Semiconductors’ customers. The countermeasures against light attacks are regarded as “best-in-class”. Hardware security certification in accordance with CC EAL5+ is attained. Also, third-party approval such as EMVCo (VISA, CAST), ZKA and others, depending on the application requirements, are available. Approved development tool chain: Keil PK51 development tool package including µVision3/dScope C51 simulator, additional specific hardware drivers including simulation of contactless interface and ISO/IEC 7816 card interface board. A SmartMX DBox allows software debugging and integration tests. Ashling Ultra-Emulator platform, stand-alone ROM prototyping boards and ISO/IEC 7816 and ISO/IEC 14443 card interface board. Code coverage and performance measurement software tools for real-time software testing. Dual interface dummy modules OM6711 (PDM 1.1 - SOT658) with special antenna bonding on C4 and C8 for testing the implanting process and antenna connection. 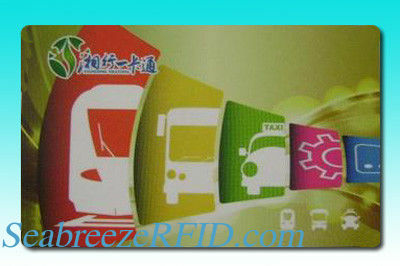 Application areas: Banking,Java cards,E-passports,ID cards,Secure access,Trusted platform modules.Even can realize a card can go through access cash, transfer and settlement currency, shopping consumption, such as financial business, and can be applied to public transport, taxis, highway, tourism, Residential water, electricity, gas and other micro-payment fee.